Boil the milk in a broad mouth pan add the roasted Vermicelli and sugar to taste. Let it boil till thick. Dissolve saffrom in 1tsp. Water. 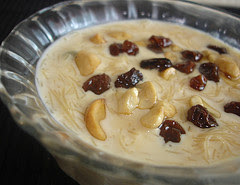 Add cardamom and saffron to the thick vermacelli and milk mixture Garnish with soaked almonds and resins. Steam whole bananas with skins, till soft. Remove skins. Mash while still hot. And keep aside. Heat 2 tbsp. oil in a pan, add seeds, allow to splutter. Add asafoetida, mint, coriander, chillies, ginger, amchur, peas and beet root. Mix this well with the mashed bananas. Add salt and other spices as well. Break the corn cobs into 1 1/2" chunks. Pressure cook till tender. Keep aside. Heat oil in a heavy pan. Add the gram dal and stir. Add the cumin and mustard seeds and wait to splutter. Add the tamarind juice, all dry masalas, sugar and salt. Bring to a boil and simmer for 5 minutes. Add the corn cobs, coriander and stir. Cover and simmer on low till the gravy becomes thick. The masala should coat the corn pieces well. Dot the hot boiled rice with butter. Serve the masala corn hot with the rice. Note: You can use tiny corn pierces or forks or your fingers to hold the corn while eating it. 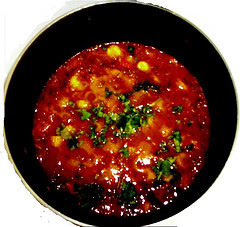 Use corn which is tender and juicy or it will become difficult to eat while hot. Variation: If you still find it difficult to eat the cobs, remove the kernels after boiling, and add to gravy. Proceed as above. Finely Chopped Ginger 1 inch. Green Chilli Chopped 2 Nos. Finely Minced Onion 1 large. Boil the rice till it is tender, strain water and keep aside. Heat Oil in a pan. Then add mustard seeds, Curry leaf, Chana dal , Urad dal and red dry chili, stir well. 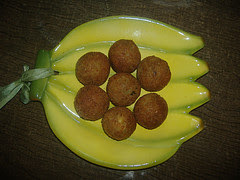 When these turns a little brown in color add green chili, chopped, ginger, minced Onion, Peanuts and turmeric powder. Again stir well and keep in heat for two minutes. Then add pre-boiled rice, lemon juice and salt. 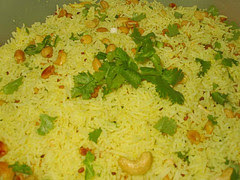 Keep these things in heat for about 3-4 minutes and lemon rice is ready, to serve. Soak the cauliflower in 4 cups of water with a little salt. After half an hour drain the cauliflower and make it dry. Make a paste of the poppy seeds and cashew nuts, by adding water as necessary. Heat oil in a pan. Fry the chopped onions till they turn golden brown. Add into it garlic paste, ginger paste, smashed tomato, turmeric powder, coriander powder, cumin powder and red chili powder. Stir well, Add 1/4 cup water and salt to taste. When the spices are fried well, add a table spoon of whipped curd. Stir continuously. In the same way add the whole curd. Stir and fry till the oil separates from the spices. Add the cauliflower to the spices. Mix the spices thoroughly with the cauliflower. 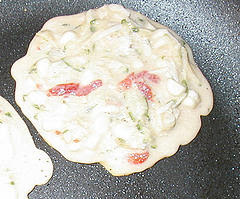 After about five minutes remove the pan from the burner and add the paste of poppy seeds and cashew nuts. Add the rest of water. Again cook the whole thing for about three minutes. 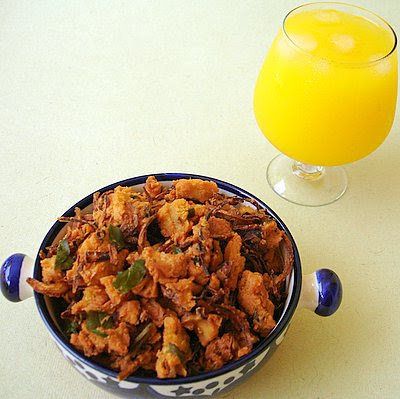 Garnish the masala gobi with chopped coriander leaves and serve hot in lunch or dinner.